I discovered this recipe in an old church cookbook and decided to try it. 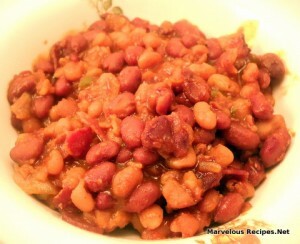 It was different from my usual baked beans but very good! Combine all of the ingredients in a 1-1/2 quart casserole; blend well. Bake, uncovered, at 300 degrees F for 1 hour. Oh if I had bacon in the house I would make these right now! I know it could be made without the baco, but that would just seem wrong. Some of those church cookbooks are filled with wonderful recipes.